I’m sort of speechless at the moment. After all, I haven’t had a lot of practice writing post-victory takes lately. I guess we can throw the ball deep. I guess we can run the ball with both force and finesse. I guess we can avoid giving up the big play at the wrong moment. This is the most balanced game I’ve seen the Raiders play in at least two years. Justin Fargas was a beast, as was Jerry Porter. Yes, Jerry Porter rose from the dead, and proved to be tough as nails. Last time I saw him play like this, it was in Washington D.C. in 2005. The offensive line was solid, and Daunte Culpepper used his newfound time wisely. Sebastian Janikowski delivered again, and while our defense gave up a lot of yards on the ground, they didn’t buckle when it mattered. It was nice to see the playbook opened up, too. Instead of saying we can’t do things, we just did them. Kudos to Kiffin for keeping locker room mutiny at bay and fielding a focused team amid the hostile environs of Arrowhead. This, indeed, bodes well for the future. By fighting instead of folding, especially this late in the season, the Raiders demonstrated that there’s finally a captain on the ship. Let’s not forget that the Raiders taunted the football gods earlier this week, and the football gods nearly had the last laugh. By deactivating Michael Bush and retaining LaMont Jordan, we sought to keep Jordan from signing with the Chiefs—thus ensuring that Kolby Smith would start for them. And who is Kolby Smith? Before today, he was a fifth-round rookie who backed up Bush at Louisville, and who had never started a game in the NFL. As of tonight, however, he is the proud owner Week Twelve’s top rushing mark at 150 yards, courtesy of our leaky line. The football gods were clearly smiling on Kolby Smith, no doubt licking their chops with the sweet taste of irony regarding his ties to Bush—but then the Autumn Wind blew the smiles off their faces. For once, finally, the ball bounced in favor of the Raiders. The best bounce of all came courtesy of Herm Edwards, who has never been regarded as a genius of clock management or strategy. With the opportunity to tie the game late with a 40-yard field goal, he went for it on fourth down, only to watch Smith get smacked for a loss. The day got even better when the Broncos kept kicking to Devin Hester—and Devin Hester kept returning the kicks for touchdowns. When they finally stopped kicking to Hester, they kicked the ball right into an oncoming defender. The Broncos lost to the Bears in overtime, setting the perfect stage for next Sunday’s game. If I recall correctly, we were tied for the longest divisional drought since the AFL-NFL merger, and a loss today would have made dubious history. But we finally got the Kansas City monkey off our back. As of today, it looks like we just might have enough horses to whip the Broncos on Sunday, and enough fortitude to start a whole new kind of streak. Nice start to the game, an interception and three points for an early lead. The red zone continues to be the dead zone, however. UPDATE: Michael Bush's backup at Louisville is already running wild (63 yards and one TD with six minutes to go in the first quarter). I'd rather see LaMont Jordan on the other side of the ball right about now, wouldn't you? This is embarrassing. UPDATE: Wow! A complete game on both sides of the ball. The AFC West spell is broken. The Raiders win. Bravo! The Raiders have deactivated Michael Bush, making him ineligible to participate in full-squad practices and any of <?xml:namespace prefix = st1 />Oakland's remaining six games this season. There are only two possible explanations for this: (1) the team has determined that Bush is not as good as we thought, and therefore not worthy of the most meager roster sacrifice (such going with three quarterbacks instead of four); or (2) the Raiders are truly scared of LaMont Jordan or Dominic Rhodes signing with another AFC West team. Neither of these scenarios is remotely palatable. It’s hard to believe that Bush could already be that much of a disappointment, and no one has stated as much. As for the other scenario, well, that’s just sheer lunacy (and cowardice). Alas, that’s all we’re left with. Try as I might, I can’t locate the method in this latest bit of madness. Kiffin conceded Bush was ready to play and that the experience would have helped him. “We just really didn’t have a spot for him right now,” Kiffin said. To activate Bush, someone would have needed to be cut - most likely Jordan or Rhodes. Coach Lane Kiffin decided against that, in part, because he doesn't want either running back signing with a division opponent and coming back to haunt him. "Like the team we're playing Sunday?" Kiffin said, pointing to the game at Kansas City. "Sure, yeah, everything counts. You've got to look at everything, and I'm sure that's a part of it. "Denver and Kansas City need a running back." We apparently won't play Jordan and Rhodes because of their poor performance and/or bad attitudes, and because they're clearly not a part of our future, but we keep them on the roster for...what exactly? Because we’re worried that they’ll come back to haunt us, even though they've been deemed not good enough to start on the anemic offense of our 2-8 football club? And we are, in fact, so worried about this that we would rather opt to stunt the growth of our future running back? After making Ron Dayne and Chester Taylor look like the second comings of Jim Brown and Barry Sanders, shouldn’t we be more worried about stopping runners in general, as opposed to the names sewn on the backs of their jerseys? The Raiders used to instill fear. Now we're playing scared. Unbelievable. And we wonder why our locker room continues to resemble the Lord of The Flies. Why we always have enough cap room to subsidize a multimillion-dollar doghouse (Porter last year, Jordan and Rhodes this year). Why the fans are so restless for tangible signs that we are ready to fully commit to the future as opposed to coddling our mistakes. Hopefully, I'm just out to lunch, and this is all part of some brilliant master plan. But from my vantage, it feels like just another trip on the crazy train. Welcome to the inaugural episode of CSI: Raider Take. Tonight, we are conducting an autopsy of the final two minutes of the Raiders’ loss to the Vikings. 1-10-OAK 18 (1:46) (Shotgun) 8-D.Culpepper pass incomplete short right to 25-J.Fargas (52-C.Greenway). 2-10-OAK 18 (1:39) (Shotgun) 8-D.Culpepper pass short middle to 17-T.Dwight to OAK 26 for 8 yards (52-C.Greenway). 3-2-OAK 26 (1:16) (Shotgun) 8-D.Culpepper pass short middle to 36-J.Griffith to OAK 29 for 3 yards (52-C.Greenway). 1-10-OAK 29 (:50) (Shotgun) 8-D.Culpepper pass short right to 80-Z.Miller pushed ob at OAK 36 for 7 yards (31-M.McCauley). 2-3-OAK 36 (:44) (Shotgun) 8-D.Culpepper pass short middle to 36-J.Griffith pushed ob at OAK 46 for 10 yards (52-C.Greenway). 1-10-OAK 46 (:38) (Shotgun) 8-D.Culpepper pass incomplete short right to 84-J.Porter. 2-10-OAK 46 (:33) (Shotgun) 8-D.Culpepper pass incomplete short left to 36-J.Griffith. 3-10-OAK 46 (:25) (Shotgun) 8-D.Culpepper pass short middle to 80-Z.Miller to MIN 36 for 18 yards (52-C.Greenway). 1-10-MIN 36 (:25) 8-D.Culpepper pass incomplete. PENALTY on OAK-17-T.Dwight, False Start, 5 yards, enforced at MIN 36 - No Play. 1-15-MIN 41 (:00) (Shotgun) 8-D.Culpepper pass incomplete deep middle to 89-R.Curry (42-D.Sharper). It doesn’t take Sherlock Holmes to identify the common clue: the word “short” precedes each and every play between the time of 1:46 and a futile Hail Mary from the 41-yard line with two seconds remaining. What’s that, Watson? You see something else? Oh, yes, that’s right—26 seconds elapsing between a three-yard gain and the next snap. Three yards and 26 seconds in the last minute while seven points down on your own 29-yard line! Oakland Raiders, you have been officially charged with intent to murder the concept of competitive football. How do you plead? Honestly, is there any other explanation for this? Why bother to throw a long-shot Hail Mary when you can’t even take the chance of throwing downfield 20 yards to avoid a long-shot Hail Mary in the first place? It’s totally illogical and inconsistent. As for the elapsed time, this has been going on for three straight years, spanning three coaching staffs, and amply documented here at Raider Take. Think about it. This is the NFL. As bad as our offense is, they represent 11 individuals in a 32-team league of the most elite football professionals in the world. Therefore, our continued inability to execute a hurry-up offense in the NFL is akin to a Harvard law professor misunderstanding the definition of “plea bargain” or a brain surgeon forgetting to apply anesthesia prior to drilling a hole in your skull. It’s simply unfathomable and inexcusable at this elite level. So where are my other postgame takes? This two-minute autopsy is all I’ve got. Otherwise, I don’t have any takes. You want me to talk about our run defense? Our inability to score touchdowns? Our increasingly creepy resemblance to last year’s team? Of course you don’t. After four years of sheer misery, I expected more than this by now, a lot more. Not necessarily a lot more wins (but at least a few more), but surely a different way of losing, with firmer hints of competence. But that's just not the case. Getting run over by a replacement running back, the absence of fundamentals, the false starts and other maddening penalties, the incoherent "two-minute" offense…Blah, blah, blah. Let’s not kid ourselves. We soundly beat the Dolphins, a team so incompetent that they might not win a game this year. And we beat the Browns, narrowly, via missed field goal. That’s the sum total of our highlight reel as of November 18. It’s not that I think that Lane Kiffin & Company can’t make a difference. It’s that I can’t believe our personnel problem is so radioactive that they haven’t yet been able to make much, if any, difference on the field. Not the best way to start off the game, one punt and seven points down just 2.5 minutes into the first quarter. Need to find a way for a good ending. Have you ever had something weighing on your mind, getting you down, to the point of depression—only to suddenly wake up one morning with a clear head and fresh perspective? Maybe it's a brilliant sunrise, or a breath of fresh dewy air, or the laughter of a child. Whatever the trigger, your sorrows fade, replaced by the redemptive knowledge that some things are just beyond your control, which ironically enhances your sense of freedom. And you realize that no matter how bad things get, God’s magnificent green earth will be forever yours to behold and enjoy. If you can relate, then you know how I felt last Sunday. The day got off to a surprising start when Cousin of Raider Take and I went to Safeway to grab some tailgating grub. As my receipt printed, the checker informed me that I’d been randomly selected to win an iPod Shuffle—a silver one, no less. Who knew that buying beer could be so rewarding? Alas, I also mistook it as an imminent sign of victory. At our tailgate, we met three folks who’d recently moved from Las Vegas to Rocklin. 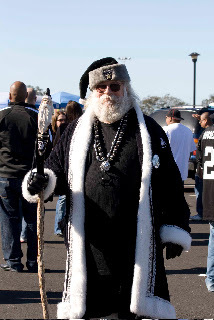 One of them was a diehard Raiders fan who was bonkers about being back in the relative orbit of Oakland. The other two, a couple, were Bears fans. The guy had an excuse, he grew up in Chicago, but he compared visiting the Coliseum to visiting Fenway Park in his quest for iconic sports experiences. Dave (a.k.a. memdf, a frequent Raider Take contributor) stopped by with his wife and daughter, and they came bearing gifts, which was very cool. 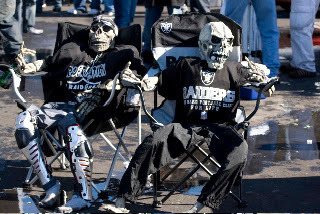 They came all the way from Chicago—but Dave is all about the Oakland Raiders. He literally oozes passion for the team and its legacy. He once met Mr. Davis in Kansas City. 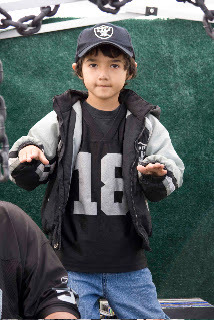 He helped remind me why, in the midst of this prolonged tailspin on the field, I am still so proud to be a Raiders fan. Cousin of Raider Take has a sharp eye for photography, and a new camera to back it up. 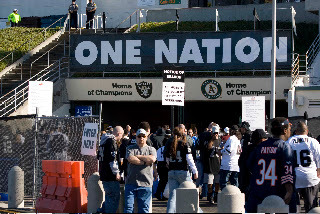 So off we went, on safari, documenting the various species of the Raider Nation, individual in expression yet united by a common genus known as the greatness of the Oakland Raiders. Some of his snapshots are included here for your viewing pleasure. Later, as I beheld the curious sight of a Josh McCown pass fluttering to the ground like a wounded bird lost in the green wilderness, I still had a smile on my face. 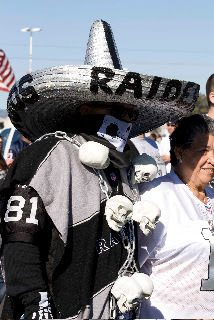 Apparently, I had come to the new-age conclusion that “it is the way it is.” I had been enlightened by the realization that no matter how many losses we suffer, the Raider Nation will never disappoint. It is, indeed, comforting to behold such loyalty, tenacity and good vibes amid the worst of on-field times. Consider that with each mounting loss by the 49ers, the colors of red and gold vanish from the streets, and are now verging on extinction. The same will be said for Patriots blue and red when their run comes to an end. But Silver and Black never fade. These colors are not a trendy garment nor a bandwagon, but rather a tattoo on the soul. Winning is still everything, but I've been joyously reminded that it's not the only thing. 1. If I try to teach my cat French, and my cat just can’t handle it, is it really fair to blame my cat? For that same reason, I’m just not going to get angry anymore about our passing offense. We’ve just got the wrong species of player, top to bottom. A 15-yard completion has achieved the status of a miracle, akin to my cat saying c’est la vie. 2. The stats don’t tell the full story in all of its sordid detail. About 40 of McCown’s meager 108 passing yards came in the final minute, when the Bears were just standing back and thinking about what’s for dinner. We went up against a five-foot-nine, seventh-round rookie cornerback and somehow couldn’t find the competence to test him, let alone beat him. 3. Can’t ask more of our defense or special teams. Long bombs happen. Except to our opponents. 4. The saddest thing of all is that if we’d beaten the Texans and Bears at home these past two weeks, we’d be in second place in our division, just one game back of the Chargers. Both games were very winnable. Except for that little problem of the biblically impotent passing game. 5. I had a really great time at the game today. That counts for something. In fact, it counts for a lot. Bonus take: Dominic Rhodes was a vital complement to Joseph Addai for the Super Bowl champion Colts last year. He carried the ball 14 times for the Colts during last year’s AFC Championship game, followed by 21 carries in the Super Bowl. Yet as a complement to Justin Fargas (!) these past two games, he’s carried the ball a grand total of one time. Weird, eh? I'll let you solve this mystery. 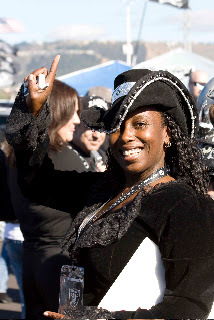 It's T minus four hours to the first day of the rest of our Raider Nation lives. The rain over Oakland has cleansed our collective souls. The cool autumn wind is blowing. The tailgate commences. Down go the Bears. 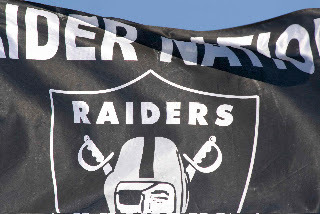 Long live the Raiders! When I flipped out after the Chargers game four weeks ago, a lot of people thought I was overreacting. Scroll down and check for yourself. My outrage wasn’t over the fact that we lost to the Chargers, however, but rather how we lost. I saw smoke and, in retrospect, my outrage was justified. The next week, I saw flames against Kansas City. But some folks still thought I was being too harsh. Then, last week against the Titans, the flames turned into a five-alarm grease fire. Now we’re beyond that. We’re talking about one of those toxic landfill infernos that burn for months, smelling of rubber and chemicals. We just lost to Sage Rosenfels and the hapless Houston Texans at home. Again. I am so sick of the excuses and rationalizations. My favorite is: what did you expect after last year? You know what, I expected a hell of a lot better than this, and if you say you didn’t, I think you’re lying. It’s not just our record. It’s how we got here, so pathetically. We’re verging on a total mirror image of last year at the halfway point. Is that what you expected? Really? Worse yet, with the AFC West being weaker than expected this year, we should be exceeding our own expectations, not underperforming them. Coming into training camp, I don't recall our rallying cry being, "Wait 'til next year!" Do you? I’m not going to analyze this game, because it doesn’t deserve analysis and, in fact, there’s nothing to analyze beyond what’s been said a million times. Awful protection, turnovers, weak run defense, inopportune mistakes, lack of heart, no will to win, zero home field pride, questionable everything, blah, blah, blah. Order up a box of TNT and detonate it. Yesterday. People are going to say that I’m whining, that I’m not “in,” and all that jazz. No, sorry, I’m totally “in,” otherwise I wouldn’t be spending my precious leisure time writing this after yet another miserable performance. I’m not whining, either. I’m guarding our stated Commitment to Excellence, that’s what I’m doing. What are you doing? Making excuses? It sickens me to hear all of these rationalizations, as if we don’t have a legacy or standard to uphold, as if our miserable personnel situation is, and has been, beyond anyone’s control, and that just because we’ve always done something one way, that’s the way we’ll always do it, circumstances be damned, and that failure exists in a vacuum of responsibility, and that we should simply accept our fate and expect nothing of the Raiders organization, except several more years to get it right, even though we have no evidence that structural or philosophical changes are being made beyond changing coaches, which we’ve now done four times since the 2003 season. My record for emphasizing the positive is unimpeachable, as evidenced by my sunny takes over the past 26 months. 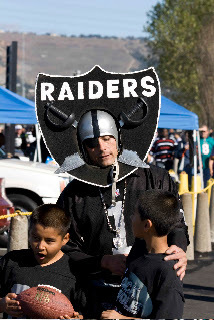 My dedication to the Raider is unwavering, as evidenced by the same. But now is a time for honesty, not excuses. So, be honest, and help me out. Where do we go from here? Backup Sage Rosenfels will be starting. Andre Johnson will be watching. The Texans' rushing offense is ranked 30th in the league. There is no reason this shouldn't be a total beatdown by the Raiders' defense, even without Tommy Kelly. Conversely, the Raiders' offense is long overdue in the touchdown department. Home field advantage is on our side. The Texans have lost five of their last six games, and the Raiders will make it six of their last seven. No excuses. No alternative. I will recognize no other possibility.